The Joint P&C/Health Bond Factors Analysis Work Group submitted a report to NAIC’s Investment Risk-Based Capital (IRBC), Health RBC (HRBC), and Property and Casualty RBC (PCRBC) working groups. The report focuses on indicated bond risk factors for the Property/Casualty RBC Formula and the Health RBC Formula. Joint work group Chairpersons Lauren Cavanaugh and Tim Deno presented an update to the property & casualty and health RBC bond factors during the PCRBC, IRBC, and HRBC work group meetings. 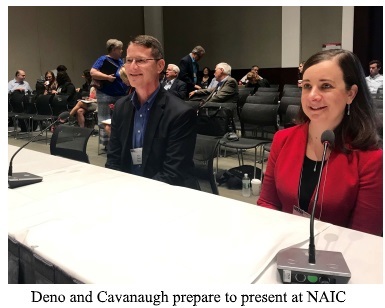 Individual and Small Group Markets Committee Chairperson Barb Klever gave an update to HATF, and Long-Term Care (LTC) Valuation Work Group Chairperson Warren Jones presented to NAIC’s LTC Actuarial Working Group. Also, Academy Past President Mary D. Miller, Actuarial Standards Board Chairperson Beth Fitzgerald, and Actuarial Board for Counseling and Discipline member Godfrey Perrott presented updates to HATF on Academy professionalism activities. The Trump administration issued a final rule Aug. 1 that will expand the availability of short-term, limited-duration (STLD) insurance plans. The rule adjusts restrictions on coverage under STLD plans from a period of three months to 364 days and allows plans to be extended up to a maximum period of 36 months thereafter. Read the Academy news release. The Centers for Medicare & Medicaid Services (CMS) released a final rule announcing the agency will resume collections and payments for the risk-adjustment program established by the Affordable Care Act (ACA). CMS suspended collections and payments for the program on July 7 following two recent court cases that diverged on the validity of the formula used to calculate payments. Read the Academy alert. CMS announced it will reduce funding for the federally facilitated exchange (FFE) navigator program. The program, which provided $36 million in federal grants for the 2018 open-enrollment period, will provide up to $10 million for 2019 open enrollment. CMS also announced that it is encouraging navigators to provide information about plans that originally did not meet the requirements for sale in the individual market under the ACA, including association health plans (AHPs), STLD insurance, and health reimbursement arrangements. Read the Academy alert. CMS accepted a Section 1332 State Innovation Waiver application by Maine, requesting the state’s reinsurance program be reinstated from 2019 to 2023. A similar application by Wisconsin to establish a four-year reinsurance program was accepted by CMS a day earlier. Eleven states and the District of Columbia filed a lawsuit on July 26 challenging the Trump administration’s June 19 rule expanding the availability of AHPs. The lawsuit cited numerous comment letters on the proposed rule, including a March 5 letter from the Academy’s Individual and Small Group Markets Committee addressing policy implications and highlighting the potential effects of broadened AHP eligibility on the stability and sustainability of the existing ACA-compliant individual and small group markets. Read the Academy alert. The U.S. House of Representatives passed three health insurance-related bills in late July. The bills, which now go to the Senate for consideration, would permanently eliminate the medical device tax, modify several provisions of the ACA, and make changes to health savings accounts. Read the Academy alert. New York Gov. Andrew Cuomo announced his state will not accept proposed increases in health insurance premiums that result from the reduction of the penalty to zero dollars for individuals who do not maintain health insurance coverage (known as the ACA’s individual mandate). Idaho Secretary of State Lawerence Denney announced that a ballot initiative to expand Medicaid eligibility will appear on the state’s November ballot. The initiative will ask voters to decide whether to expand Medicaid eligibility to working-age individuals with incomes up to 133 percent of the federal poverty level, consistent with the Medicaid expansion criteria established by the ACA. Attendees can earn up to 27 hours of CE credit, including up to 2.7 professionalism hours, at the Academy’s upcoming Life and Health Qualifications Seminar. This annual event, to be held Nov. 4–8 in Arlington, Va. (suburban Washington, D.C.), delivers an agenda packed with training and instruction to allow you to obtain qualifications or relevant continuing education credit necessary to issue actuarial opinions for either the NAIC Life and Accident & Health Annual Statement or the NAIC Health Annual Statement. Limited space is available. Don’t miss out—register today to secure your space. The Tribune-Star (Ind.) and the Center for Health Journalism cited comments from Academy Senior Health Fellow Cori Uccello on AHPs. “AHPs will have more flexibility in how they vary premiums and what benefits are covered,” Uccello said. The Washington Examiner cited comments from the Academy’s news release on the implications of expanding STLD insurance that some younger and healthier individuals may move away from ACA-compliant coverage and opt for short-term coverage. A Health Affairs blog post cited the Individual and Small Group Markets Committee’s April comment letter to the Department of Health and Human Services that highlighted the potential implications of expanding STLD insurance. Discounted registration rates are still available for the Academy’s 2018 Annual Meeting and Public Policy Forum. Breakout sessions will cover the latest developments in today’s top public policy and professionalism news, including a look at long-term care insurance experience, a dialogue with representatives of the Center for Consumer Information and Insurance Oversight, and exciting new research on health care reference pricing. Other agenda highlights include an interactive game show developed by the Academy’s Committee on Professional Responsibility, a keynote address by political analyst Charlie Cook of the Cook Political Report, and an optional-participation murder mystery to test your deduction skills during our Nov. 1 dinner. Join us in November, and register today.